Defensive drivers make sure they are visible to others on the road to prevent auto accidents. Hold the steering wheel at the 9 o’clock and 3 o’clock positions, which is safer than the previously recommended 10 and 2 o’clock positions. Avoid distracted driving behavior, including (but not limited to) using a phone (including both voice calls and texting), using a dashboard infotainment system, tending to a child, eating, holding a dog, or applying makeup. Be alert and focused on the road. Scan the road ahead, and look in the rear-view and side-view mirrors, checking for obstacles in the road and traffic that is slowing down, in order to anticipate potential problems. Drive only when you are feeling calm. Don’t drive when you are tired or upset. If you become tired while driving, pull over to a safe spot, like a parking lot or a highway rest stop, and take a nap, or get a cup of coffee. If you have a long drive, plan for periodic rest stops. Keep up with traffic. It can be dangerous to drive either too fast or too slowly, as the safest driving speed is the one that keeps you in the flow with the speed at which most other vehicles are moving. While driving, notice a fixed object on the road ahead. When the vehicle in front of you passes that object, count: “One independence, two independence, three independence.” If you pass that object before you are done reciting that phrase, drive more slowly. This way, if that vehicle stops short, you should have enough reaction time to avoid rear-ending it. Always use your vehicle’s turn signals, even when you are in a left-turn or right-turn lane. That will enable other drivers to know you are about to make a turn, and they will accordingly slow down safely. Make sure to turn on your headlights when the sun goes down or when it’s starting to get dark out, and in inclement weather like rain. This helps other drivers see your vehicle. Colorado’s law requires you to turn on your headlights from sunset to sunrise, or when you are unable to see at least 1,000 feet ahead. In addition, the state requires that you turn on your vehicle’s parking lights any time it is parked alongside the road, whether or not anyone is in it, between sunset and sunrise, or when there is no visibility beyond 1,000 feet ahead. It is essential that your operational brake lights are working. Those are the ones that let vehicles behind you know that you are slowing down. That lets them know to slow down as well. Defensive driving includes avoiding the blind spot of a vehicle in front of you or in an adjacent lane. Many people will check their mirrors only before making a lane change. If you’re lurking slightly behind and a lane away from another vehicle, assume that the driver of that car can’t see you. Either safely speed up or slow down to avoid this scenario, which often results in an auto accident. It is dangerous to retaliate when an aggressive driver does something that angers you, such as cutting you off or tailgating. If the driver behind you is too close for comfort, tap your brakes a few times to signal the need for safe spacing between the vehicles. If that driver persists, then gradually slow down, to encourage him or her to pass you. If you see a speeding driver or one who is aggressively changing lanes behind you, stay in your lane and maintain your speed. To help prevent gridlock, move through an intersection only when it is completely clear of traffic. That way, you will avoid getting stuck waiting in the middle of the intersection for traffic to move out of it. Getting stuck waiting puts your vehicle at risk of being T-boned by another vehicle. Be careful when turning into an intersection, as many rear-end collisions happen when the driver behind you thinks you are going to make the turn, even if traffic is backed up. If you do find yourself stuck in an intersection, make sure there is adequate distance between your vehicle and others, just in case the driver behind you rear-ends your vehicle, so that the vehicle in front of you is not involved. It is best to drive more slowly in bad weather. Tires lose traction at higher speeds, so slow driving wins the safety race. 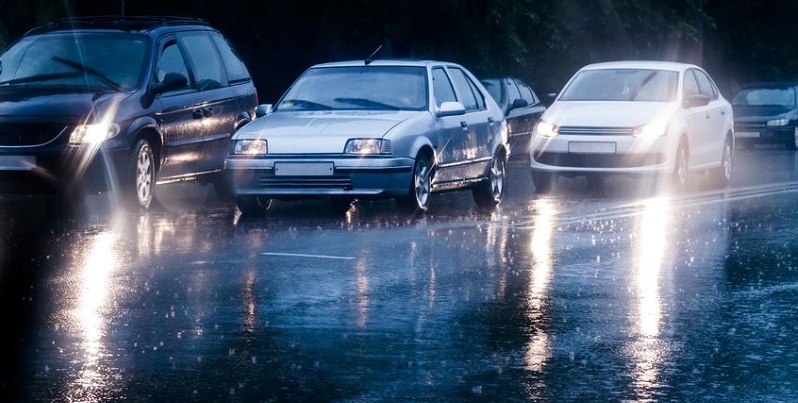 Even a light rain can produce dangerous driving conditions: When it has not rained recently, even a slight rain can pick up oil from the road, making it slippery. Read a Department of Motor Vehicles brochure to remind yourself of road rules. It contains information on rights of way, road signs, and traffic laws, and also features safe-driving tips. Taking a defensive driving course in Colorado may help you have a traffic ticket dismissed, avoid having points added to your driving record, remove existing points, and avoid having your car insurance rates raised. And such a course can help you to reduce your car insurance with a safe driver discount. Colorado Safe Driver (CSD) is an initiative offered by the Colorado State Patrol and the Colorado State Patrol Family Foundation. CSD offers four programs: Alive at 25, Attitudinal Dynamics of Driving, DDC (Defensive Driving Course) Online, and DDC Motorcycle Safety Program. While defensive driving is important for all types of drivers, you can learn more detailed tips in our safety guides for motorcyclists, parking lot settings, and when sharing the road with large commercial trucks.